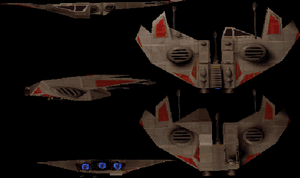 The Kor-larh (or Korlarh) is a two-seat Kilrathi fighter-bomber flown through the end of the Terran-Kilrathi War. A Kor-larh squadron flew off the KIS Shiraak in 2669. Kor-Larh Target Identification, circa 2669. This page was last edited on 26 June 2011, at 19:50.